Joseph McQuade is a SSHRC Postdoctoral Fellow in the Asian Institute’s Centre for South Asian Studies at the Munk School of Global Affairs and Public Policy. He is also Co-Editor-in-Chief at the NATO Association of Canada, where he runs the newly-created Centre for Disinformation Studies program stream. Dr. McQuade is affiliated with the Queen’s University Global History Initiative and with the Canadian Network for Research on Terrorism, Security and Society, and contributes as Managing Editor of the Journal of Indian Ocean World Studies. 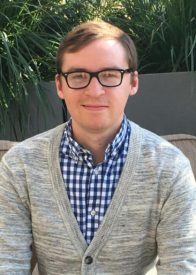 Dr. McQuade completed his Ph.D. at the University of Cambridge as a Gates Scholar, with a dissertation that examined the origins of terrorism in colonial South Asia in international perspective, a project that forms the basis of his first book. His postdoctoral research at the University of Toronto interrogates the relationship between ethnic conflict, security, terrorism, and the environment in the borderworlds between India and Burma (Myanmar). His broader research and teaching interests include critical genealogies of terrorism as a political and legal category, the global history of political violence, and the relationship between insurgency and nation-states. Special issue in History Compass 15, No. 2, Theme: “Making and Unmaking the Nation in World History” (with Alastair McClure and Sophie-Jung Kim). “Introduction”, in “Making and Unmaking the Nation in World History”, co-edited special issue of History Compass 15, No. 2 (with Alastair McClure and Sophie-Jung Kim). “The New Asia of Rash Behari Bose: India, Japan, and the limits of the international, 1912-1945”, Journal of World History 27, no. 4, 641-667. “Political discourse, political violence: Fenians, nihilists, and the revolutionaries of Bengal, 1907-1925”, Sikh Formations 10, no. 1, 43-55. SAS2004H1: Issues in South Asian Studies: A Region and the Disciplines, Or how is a place produced and known? CAS490H1: Terrorism in South Asia: A Global Perspective. × Strict NO SPAM policy. We value your privacy, and will never share your contact info.